The shoulder joint is classified as a synovial ball-and-socket joint. As the name suggests, your arm (humerus bone) fits into the shoulder socket and allows for movement in all directions. This provides a functional advantage; however, the complex structure of the shoulder joint and the structures around it make it one of the more commonly injured areas of the body. There are many different types of shoulder injuries, ranging from mild ailments due to overuse, to sever acute injuries resulting from some sort of trauma. In any case, damaging this highly functional joint in any manner can limit your capacity to go about your normal routine, especially in a pain-free manner. Moreover, since the shoulder joint is responsible for so many movements and everyday functioning, it can be a really tricky area to rehabilitate quickly. In this article, we would like to discuss some of the advantages of shoulder braces when it comes to treating injuries and other conditions, and we will provide our top picks for the best shoulder braces. Further along in the article, we will also provide more information about shoulder anatomy and injuries in general, so please feel free to check that out as well! We are assuming most people that check out our article are interested in shoulder braces to some capacity, so we will get straight to the point and provide you with our picks for the Top 10 best shoulder braces. We will also highlight 5 of these in more detail below the table, before moving on to our general info about the shoulder. Lastly, we also reviewed the best shoulder braces for football specifically, so if definitely check that one out if it's applicable to your needs, as we tried hard to put a bunch of useful information into one article. NOTE: Most of the images of the shoulder braces depicted below show men in the pictures. Please keep in mind that all of these shoulder braces can be worn by both men and women. We're not exactly sure why most companies tend to show the braces on men, but our guess is that it's easier to demonstrate the general use/fit, particularly with the shirt removed. Additionally, since we're showing a variety of shoulder brace styles, these braces aren't ranked in any particular order. This brace and its padding provide sold impact protection. Heavy duty molded EVA shoulder support with 1680D ballistic nylon. 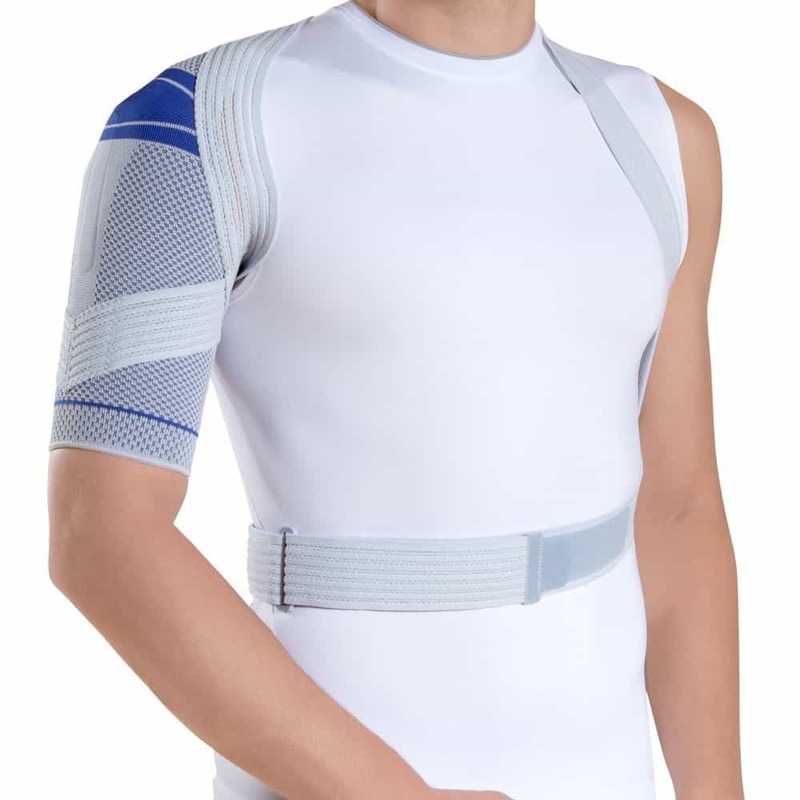 This adjustable shoulder brace is made by a reliable bracing company (McDavid). Includes pockets over the AC joint for ice/heat packs or additional padding. A minimalist design meant to provide adjustable compression while supporting and warming the shoulder joint. Still allows for a good range of motion. Viscoelastic knit fabric stabilizes and guides the shoulder joint without limiting movement. Very lightweight and breathable. Made in Germany. Good for rotator cuff injuries and recovery. "One size fits most", but is still adjustable. Fits both left and right shoulder. Made with SBR, OK cloth, and nylon. This adjustable brace is good for support and protection of an injured shoulder joint. Provides therapeutic warmth and light compression. Great choice if you need ice and compression. Comes with gel pack that can be placed in fridge or freezer. Pump allows for form-fitting compression of ice pack. This simple design incorporates high quality and comfortable materials. Easy to adjust while wearing. Great choice if you need to wear a sling for long periods at a time. Another pump design, this brace's pack can be used for cold or heat, with compression applied to the entire area. A little bulky, but gets the job done. Can be worn on left or right shoulder. This highly adjustable sling comes with a side pad to relieve pressure on the ulnar nerve and to position the shoulder in a comfortable 15 degrees of abduction. Three-point strapping system helps to evenly distribute weight and support. This EVS Sports SB04 shoulder brace is a bit different from similar designs in that it includes a supportive shoulder cup , which can provide more restriction of movement for those that need it. The extra bit of padding is also a welcome addition to those playing contact sports. This added shoulder padding is made of molded 1680D ballistic nylon, which makes it very strong without adding barely any weight. This particular EVS shoulder brace is reversible, allowing it to be worn on either the left or right shoulder. However, it should be noted that the impact protection on the shoulder has mixed reviews. Some love it, some don't. This will depend largely on your activity. If you're returning to activity to the point where you're wearing pads again, or you simply don't need the extra protection, or you are prioritizing stability and compression rather than impact protection, then you may not need something this robust. If you fall into one of these categories, but really like this brand or the overall design of this shoulder brace, no need to worry. They have a very similar model that is basically the same without the extra padding. The EVS SB03 is basically the same as the SBO4, just without the extra shoulder pad. This one is also quite popular, although some customers have struggled with finding the proper sizing. The EVS design is less bulky than some other more expensive brands, but depending on your injury, this can be the proper shoulder brace for somebody looking for a little added shoulder support. This comfortable and adjustable mid-range brace can also be used on both the left and right shoulders. EVS has also added a new adjustable arm closure that helps eliminate underarm chafing, which is definitely a practical factor worth considering. This is a nice supportive shoulder brace than many people love. Overall, both of these EVS shoulder braces provide solid value. Keep in mind that the price for each of these braces is quite reasonable compared to other higher end models that basically do the same thing. At the end of the day, the vast majority of customers love the brace, but the jury is still out on the additional shoulder pad provided by the EVS Sports SB04 shoulder brace. This design of this shoulder support brace is about as simple as you can get. This can be either an advantage or disadvantage depending on exactly what you need. For example, if you are in the later stages of injury recovery, you have long been healed from injury and just want a bit of added support for injury prevention, or you want a little bit of added compression for conditions like osteoarthritis, the WindFeel Shoulder Support Brace could be a good choice. That being said, given it's so lightweight in design and isn't overly robust, the overall support is slightly limited. It's still noticeable better support than not wearing a brace, but if you need something that strictly controls the movement of your shoulder, or immobilizes it altogether, then you likely require something else like a sling or a more robust shoulder brace with a specific purpose. So other than being slimmer than lots of other designs, what does this shoulder brace have to offer? First, it provides a nice level of compression for conditions like osteoarthritis, or any other chronic condition that leads to pain and stiffness. Coupled with the fact that it's made with neoprene, this brace can provide some therapeutic warmth, so when combined with the compression, it's great for the aforementioned conditions. While they market it as being suitable for all injuries, chronic or acute, just remember this depends on where you are in recovery. This still allows for quite a bit of motion, so if your shoulder joint is extremely unstable or needs to be fully immobilized, you may want to look elsewhere. You doctor or physiotherapist will be the ones to direct you towards certain designs, as they can assess your condition in a hands-on manner with care catered to you individually. This brace comes in one size fits all (except children) due to the highly adjustable nature of the device. The particular brace that we link to here is for the left shoulder, but you can also find it available for the right shoulder. Overall, this is a very well-liked brace, especially by those who prioritize comfort and a slim design that can easily be worn under clothes or equipment. It doesn't provide a lot of rigid stability, and certainly doesn't immobilize the shoulder, but the compression, therapeutic warmth, and moderate stabilizing action makes it a great choice for those further along in recovery, or those suffering from chronic conditions like osteoarthritis that corresponds with constant pain and stiffness. This is a really cool shoulder brace, but it comes in at the upper end of the typical price range for braces. The reason for this is the thoughtful design with super high-quality materials, which has pretty much been typical of German engineering standards. It doesn't provide stabilization simply by limiting movement, but rather, combines knowledge of anatomy and biomechanics to allow you to function as highly as possible while still protecting your injured shoulder. The material is mainly a viscoelastic knit fabric. Viscous means that when the material is deformed (in this case, stretched) it will behave both as a viscous material and an elastic material, which helps provide strong support and compression, but in a very controlled manner. This helps with the overall goal of the design, which ultimately, is to center the arm in the socket so that it prevents rotation, but still allows for a high range of mobility. The knit fabric that we mentioned is very nice, not like a sweater or something like that. In fact, even if you don't have much experience in the sports medicine realm, you may still recognize this material being somewhat similar to material used when wrapping injured joints, such as ankles. The knit fabric is very breathable and won't retain heat. For some, this could be a downfall if you're looking to loosen up the joint, but on the other hand, this means that if you wear it while working out, it shouldn't cause excessive sweating and subsequent irritation or smell. Furthermore, it can be worn on the left or right shoulder, so there is also a level of convenience to this shoulder support. Overall, this is an intelligently designed shoulder brace that could be great for a lot of different conditions, but it comes with a steep price. Nevertheless, this brace is known to be extremely durable and effective, and is especially good if you want something with a slim design to wear under clothes or equipment. It provides a good level of stability while still allowing for a large degree of motion, and it doesn't cause you to sweat. We highly recommend this brace, but only if it's well within the budget. Otherwise, you can still find something effective and with good value in a cheaper brace. * NOTE: We have noticed some females speaking very highly of this brace due to the fit. As a male writing this article, I don't have the personal experience to provide my own input, but simply looking at the design, I can see why this may be more suitable for female anatomy than some other braces on the market. This shoulder brace incorporates a design that we are starting to see become increasingly common among shoulder braces for any part of the body. Essentially, this brace includes a gel pack that can be used for both heat and ice, but rather than just being placed on the shoulder and a brace strapped on over top, it can actually slide into the brace itself. Furthermore, the pump can be used to slightly inflate the brace. This acts to provide a highly adjustable level of compression on your shoulder, and when used in conjunction with heat or ice, allows for the heat or ice to be distributed evenly over the shoulder with an anatomical fit. As you may have guessed form the picture, the main downside of this shoulder brace is the size. It's a bit more robust because it needs space for the heat/ice pack, and it also includes the pump mechanism. This means it will be highly difficult, if not impossible, to wear under clothing or equipment. However, heating or icing your injury in a significant manner like this is usually done at rest, so perhaps you will use this at the beginning of injury recovery or when sitting at home, and then transition to a slimmer design for activity. In addition to the clever application of heat/ice, the convenience in this shoulder brace lies in its ability to be worn on the left or right side, and it's easily washable for what it is. It's also not that expensive for something with a decent number of components. Overall, this is a good shoulder brace for injury recovery, especially if you need to support your shoulder while effectively applying heat or ice. It combines everything into one. Heat and ice therapy, adjustable compression, and stability. The only thing its lacking a slim design for use during activity, but with the incorporation of heat/ice packs and the pump, this was probably out of the question to begin with. The DonJoy UltraSling IV Shoulder Support is arguably one of the most advanced shoulder slings out there. Most people envision a sling being made from one piece of properly folded fabric, which is quite often the case, but DonJoy decided to take it to a completely different level. The first thing you may notice is the big pad between the arm and the side. This pad serves a few different purposes. First, people simply tend to find it a comfortable feature. Fair enough. Secondly, this pad helps to relieve any stress placed on the ulnar nerve, which is the nerve that runs down the inside of the arm over the medial side of the elbow (when you hit your funny bone, you're actually hitting your ulnar nerve). Lastly, this pad places your shoulder in approximately 15 degrees of abduction. Abduction is the movement of lifting your arm away from your body to the side. 15 degrees provides an optimal balance between stability and comfort. Given that shoulder slings are mainly used to immobilize the arm, they are often used immediately after injury or surgery. This also means that they are usually worn for long periods of time at once, which can get annoying after a while if it's uncomfortable or becoming too hot. Thankfully, this DonJoy shoulder sling also comes with a moisture-wicking inner lining that provides a nice level of ventilation. Additionally, the three-point strapping system evenly distributes the weight and support, further facilitating user comfort. Lastly, this sling can be worn on the left or right shoulder. Overall, this is an excellent shoulder sling. It's particularly useful for post-operative care, or for immobilization following an injury. It should be somewhat apparent that this sling doesn't allow for a range of motion, so it's uses are limited to immobilization. That being said, it's still highly comfortable, and all the features have a logical purpose - no gimmicks. The main downside is it's super expensive by sling standards. Therefore, if you're just looking for something that is way better than what the hospital provides, but you don't want to break the bank acquiring a single shoulder sling, you may want to check out a cheaper alternative - The Custom SLR Medical Arm Sling, which has also been extremely well-reviewed. Most people think of the shoulder joint as a simple ball-and-socket joint and that's it. While the primary articulation (humerus and scapula) is in fact a ball-and-socket joint, there are a couple other joints in the area that contribute to the functioning of the shoulder. Moreover, once you incorporate all of the other structures like ligaments, muscles, nerves, arteries, and veins, then things become quite complicated. Therefore, in this section, we will attempt to provide you with simplified information about the more clinically important aspects of the shoulder joint. I've always found that understanding anatomy can go a long way, whether it's helping you with choosing an exercise for a particular muscle group, or recovering from an injury, we hope you find this helpful, too. This glenohumeral joint is the main articulation - the ball-and-socket joint that we referred to previously. In the image here, the glenohumeral joint is formed between the head of the humerus (purple end of the arm bone) and the glenoid cavity (socket for the purple part), hence "gleno" and "humeral". Notice some of the other structures that ​pass over the glenohumeral joint, but under other structures. There are more structures than what are shown here, but this still gives you a good idea of the complexity of this shoulder joint complex. For example, supraspinatous muscle that is point out in the image is one of the four muscles that forms the rotator cuff. These muscles can easily become impinged or damaged from overuse, and if they are injured acutely from a form of trauma, their subsequent healing can be tricky with continued use of the shoulder. Also notice the bursa sac, which is colored blue in this image. Bursa are often found around joints in the body, especially those like the shoulder, which have lots of different structures passing through that need to slide by each other. The bursa will help reduce friction, allowing for a more lubricated gliding movement. There is more than one bursa sac in the shoulder, but the general point to know is that these can become inflamed or even infected if they are constantly impinged, which can lead to pain and swelling. Check out this video below on an example of what treatment for a shoulder injury could look like (depending on the injury of course), which could help solidify your understanding of the shoulder joint anatomy as well. The acromioclavicular joint, or AC joint, is the articulation between the acromion of the scapula bone and the lateral end of the clavicle bone, and this joint sits just above the main glenohumeral joint. This joint doesn't normally allow for much motion at all, just a little bit of gliding motion, as it is tightly bounded by ligaments. NOTE: the other joint depicted in the image (the bony process that is just below and to the right of the acromion - also injured in this image) is the coracoclavicular joint. While the AC joint can be injured in isolation, it is often accompanied by damage to structures that support this coracoclavicular joint. The main reason for this is the typical mechanism of injury. AC joint injuries are very common from hard jarring falls on the side of the shoulder, such as being tackled, landing on the side of your shoulder, and having someone land on top of you as well. Another common example of an AC joint injury in sports is when a hockey player is forcibly checked into the boards. Again, you have this compression that basically squeezes the body together. In this case, the boards and the opposing player form the 'sandwich'. We're going to shift back a little bit to the main shoulder joint - the glenohumeral joint. If you look at the picture in that section, you might notice that the glenoid cavity of the scapula doesn't fully engulf the head of the humerus. Rather, only a portion of the head of the humerus is in contact with the glenoid cavity, so on its own, it's really not that stable. Instead, the shoulder joint will require ligaments to reinforce the joint capsule, which can be seen in the picture in the AC joint section just above here. However, even these ligaments aren't enough on their own. We also need strong dynamic stabilizers, which in this case, are the rotator cuff muscles. There are four muscles that make up the rotator cuff muscles. They all have the same general purpose, which is to support the shoulder joint, but they cross the shoulder point in different areas, so their exact actions all vary slightly. You may also see these muscles referred to as the SITS muscles, which is just an acronym formed from the beginning letter of each muscle. The 4 rotator cuff muscles are supraspinatous, infraspinatous, teres minor, and subscapularis. These muscles can become acutely damaged in the form of a strain/tear, but they can also become damage from chronic inflammation of themselves or other structures around them (which will subsequently push on the muscle), as well as general overuse. For example, baseball players have a incidence of both acute and chronic shoulder injuries, as the constant throwing, especially with the arm overhead, can lead to problems with time. We could have gone on for pages and pages about shoulder anatomy and associated injuries, but we felt this was a good summary of the most common sites of injury, which will hopefully help guide your selection in choosing the best shoulder brace for your needs. While we always recommend that you visit your doctor or physiotherapist to pinpoint your exact injury or condition, the more you know, the better equipped you will be to making an optimal selection. Good luck!